If you’re unfamiliar with Kurt Vile, considered by many to be indie rock’s resident “Dude” Lebowski, this line from his new album “b’lieve i’m goin down” might ring with uncalled-for egotism. But if you’re familiar with his brand of so-called “stoner” wisdom (though, as he quipped on his previous album, he’s never “touched the stuff”), then you probably won’t take this line too seriously. You may see it as just another case of Vile’s irony — his false bravado just another example of his knack for mingling humor and sadness. 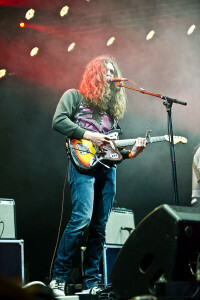 Though “b’lieve i’m goin down” continues this trend, Vile has said in interviews that this album is gloomier, a so-called “night album,” in contrast to 2013’s sun- and reverb-drenched “Wakin on a Pretty Daze.” In addition to being more melancholy than his previous album, “b’lieve i’m goin down” is also, strangely, funnier. The ever-shifting mood of Vile’s world, which doles out melancholy and humor in equal measure, makes for a compelling listen. Unlike many artists who explore melancholy and angst, Vile doesn’t take his pondering too seriously, always cutting short any existential navel-gazing with a snarky turn of phrase. At times, Vile cuts out the musings entirely and lets his agile guitar-picking do the talking. Musically and conceptually, “b’lieve i’m goin down” more resembles 2011’s “Smoke Ring for My Halo” (another so-called “night album”) than 2013’s “Wakin on a Pretty Daze.” “b’lieve” also brings in other instruments — such as piano (“Life Like This” and “Lost My Head there”) and banjo (“Outlaw”) — to share the guitar’s spotlight. Despite such adornment and a lively opening track, “b’lieve i’m goin down” feels like a quieter, more introspective album than Vile’s previous efforts in many ways. Emphasizing this change is the fact that, in general, the album features less reverb and more acoustic guitar. Such an alteration, however, does nothing to clear the smoky haze of Vile’s surreal, enveloping world. Indeed, Kurt Vile’s wizard-like guitar playing, his low-down, dusty baritone, in addition to a well-placed piano chord or two, are more than enough to pull the listener into his unique fog. And what an enjoyable fog it is.